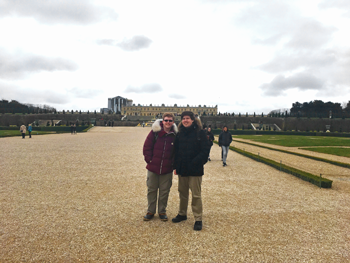 Students immersed themselves in the sights, sounds and tastes of France during a spring break learning trip to Paris and Provence. They visited the tourist sites — Versailles, the Louvre, the Eiffel Tower and Notre Dame – but they left marveling at the beauty of the southern countryside. Provence, with its unspoiled historic architecture and made-from-scratch hot chocolate, was a highlight for Lucson Pierre. He also got a firsthand glimpse of paintings that he learned about in humanities class. At the beginning of the trip, students are given a metro card, hotel room key and the freedom to plan their own adventures. Victor and Thaddeus Cook ’21 took an excursion to Saumur to see the cavalry school and other sights related to the French military. The attractions and artifacts in the Chateau de Saumur, a castle on a hill overlooking the Loire River, date back centuries. Throughout the trip, the brothers, both studying management with a concentration in franchising, sampled pastries, sandwiches, baguettes and croissants. Pierre paid close attention to how the French shop owners conducted business. The boulangerie owners, for example, weren’t focused on making as much money as possible. “They found satisfaction in making their best product,” Pierre said. Victor Cook noticed a similar attention to detail as they toured the Louvre. The former palace, even the fountain outside, is covered in gold. Many visitors are too busy admiring the exhibits to notice the elaborate painted ceilings. “You’re surrounded by the pinnacle of what humanity can create,” Cook said. Top photo: Thaddeus and Victor Cook explore Saumur, France. Bottom photo: Students prepare to enjoy a meal together in France.